PHOENIX, Arizona, July 26. IN our fourth in this five-part series looking at the history of the Olympic venues for swimming, we look at the five facilities that hosted the final five Olympics of the 20th century. 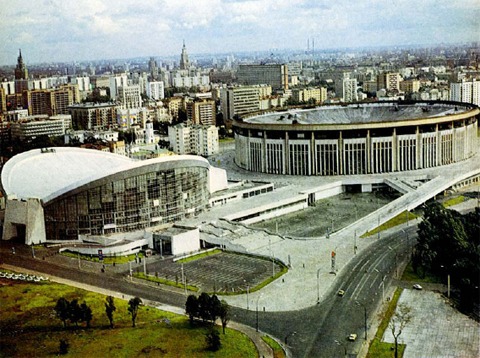 At the 1980 Olympics in Moscow, the American-led boycott meant fewer athletes would get to experience the Olympijsky pool, which borrowed from the idea of the Montreal Olympics and coupled the design with another major building. 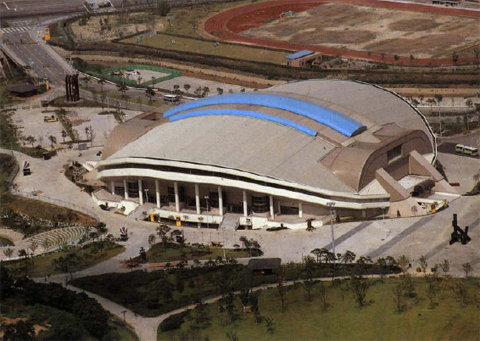 In this case, it was the Olympic stadium, which hosted basketball and boxing events in two separate halls. This new facility was built for the swimming competition, despite the fact that Moscow already had a suitable pool for Olympic swimming. It is unclear if FINA still had a policy that all Olympic swimming must be held outdoors in 1980, but as you can see from the photo below, the pool had adequate seating. Perhaps Montreal's introduction of a 10-lane Olympic pool was the catalyst for a new pool, as the existing pool only had eight lanes and the new pool featured 10. As for the new facility, a glass partition between the main competition pool and the diving well made it possible to stage both swimming and diving at the same time, something that had never been done before. The Olympic competition pool and warm up pool are still in use today, with few changes. 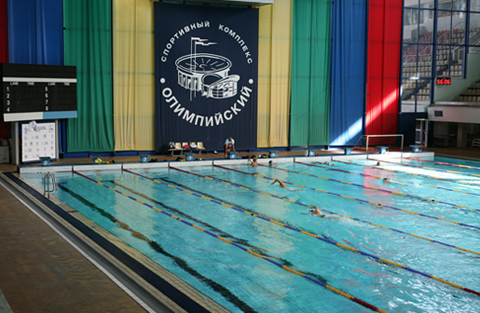 It hosts most of Russia's national championships, as well as the Moscow stop of the FINA World Cup. 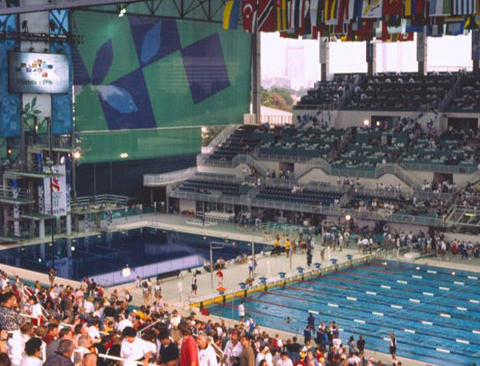 Though the venue used as the main stadium for the 1932 Olympics was given a major renovation for track and field events, as well as the Opening and Closing ceremonies, the pool adjacent to the L.A. 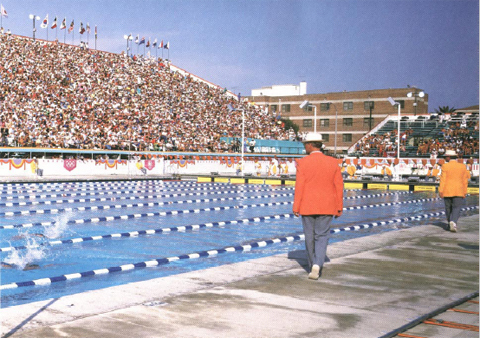 Coliseum was not picked to host swimming again in 1984. The layout of the pool no longer provided for enough spectator seating, nor was the facility adequate for competition. Organizers looked north for their answer, to the University of Southern California, where the athletic department was hungry for a new venue for its successful swimming teams. The Olympic Swim Stadium received its funding from the fast-food chain McDonald's, though restrictions placed by the International Olympic Committee prevented the company from displaying its name on the building until after the Olympics, which it did and continues to do today. The facility was built on the campus of the University of Southern California, and was the first Olympic outdoor swimming pool built in 24 years. (A FINA rule previously required all Olympic pools to be indoors.) At the time, the pool's moveable bulkheads were a unique feature, allowing the pool to be used for short-course and long-course competitions. Another unique feature was backstroke start handles built permanently into the ledge of the deck, instead of on the starting blocks. The only drawback to the pool was the return to eight lanes of competition instead of the 10 used in Montreal and Moscow. A little “breathing room” was put on the sides of the pool — about a couple of feet — to allow the placement of lane ropes along the walls to help ease wave turbulence. Most of the pool was the standard 2 meters deep, but at the starting end and extending out for about 10 meters, the pool depth was 3.96 meters, or 10 feet, deep. 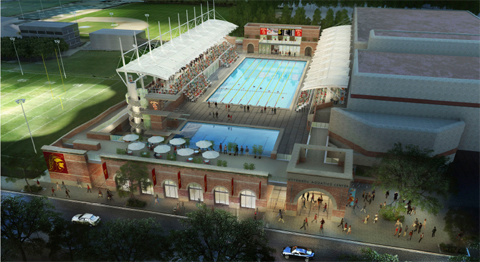 USC continues to make the most of the McDonald's Swim Stadium, and it has become a popular competition pool. It hosted many regional and national competitions over the years, and is set for an $8 million renovation that will provide a new diving tower, locker rooms, spectator area with shade structures and a video scoreboard. The new facility will be named the Uytengsu Aquatics Center, after a former swimmer. The pool itself will be named the Peter Daland Pool, after the famed USC coach. The pool for the Seoul Olympics was missing a major feature of every Olympic pool since 1908. It did not have the flat walls that rise about a foot above the water surface at the start and turn ends. As such, photos from the meet show the touchpads — which were required to be a certain height above the water surface — anchored on the pool deck by a temporary plastic wall. The ceiling contained large sunlights, which reduced the cost of lighting the facility. 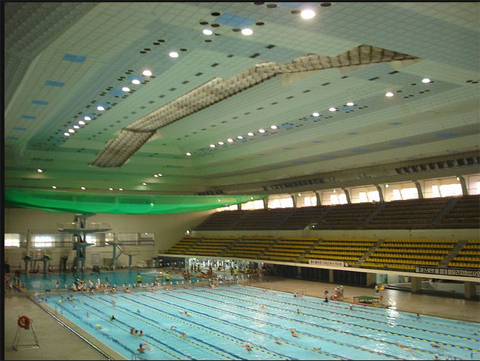 Like Los Angeles, the Seoul pool had varied depth, ranging from 2 to 3 meters, making it the deepest Olympic pool at the time. The Olympics also returned to using 10 lanes for competition. The Piscines Bernat Picornell complex was named after the founder of the Spanish swimming federation and was originally built for the 1970 European championships. 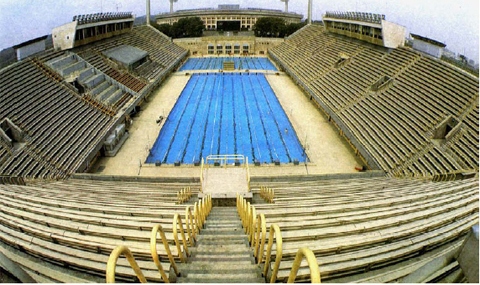 When Barcelona was awarded the Games in 1986, the only major changes needed were to add temporary seating for the throng of spectators and cover the second long course pool, which was used for warm up and warm down. That pool is located in the building behind the main scoreboard. The pool is now used mostly for recreational purposes, but often is where the Spaniards hold their national championships. 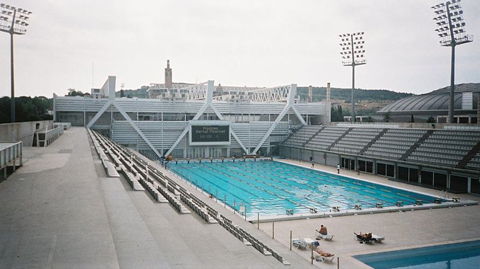 Barcelona will be the site of the 2013 FINA world championships, and as was the case in 2003, the swimming will not take place at the Bernat Picornell pool. 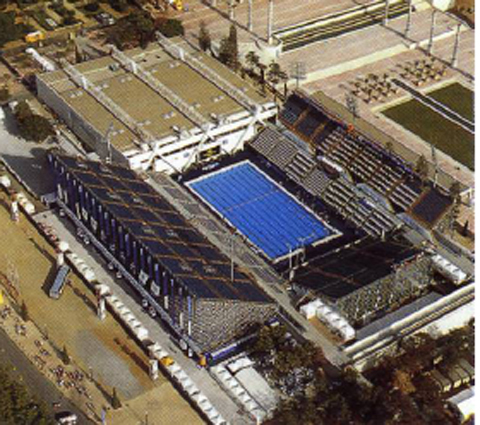 It will be held instead inside the Palau Sant Jordi arena, which seats 12,000 people. The Bernat Picornell pool will be used for water polo at the world championships. The architects behind the pool hosting the swimming in Atlanta apparently couldn't make up their minds about how to build the facility? Should it be an outdoor pool? Should it be indoors? It appears no official determination was made, as the Georgia Tech Aquatic Center was open to the elements but also had a roof over the pool. Two sides of the building — the scoreboard end and the diving well end — had screens stretching from floor to ceiling. The spectator and press sections were under the roof structure but not supported by a wall. 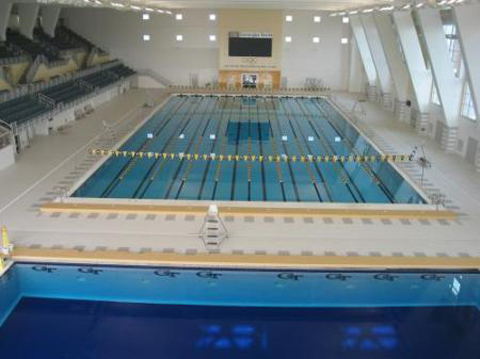 Not long after the Olympics, Georgia Tech decided to enclose the facility on all sides, with no changes made to the competition pool. The warm up pool used at the Olympics was the university's existing 50-meter pool, and that pool is still in use today. The aquatic center hosts USA Swimming nationals and other championship meets regularly. Its largest international meet since the Olympics was last December's Duel in the Pool, which featured the United States against Europe. 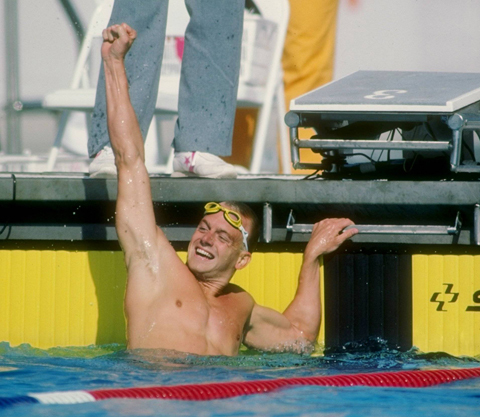 Send feature story ideas to jeffc@swimmingworldmagazine.com.